Third time’s not only a charm; it’s also lucky number 13 for Kevin Hess. 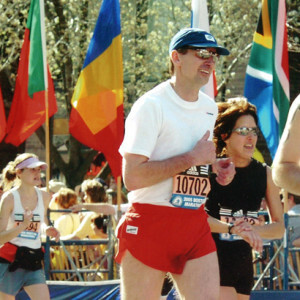 On Monday, Kevin Hess, executive vice president of Government and Regulatory Affairs for TDS, is running the Boston Marathon for a third time in his long running career. The annual Patriots’ Day 26.2-mile race will be Kevin’s 13th marathon. Kevin will join 30,000 other runners Monday morning at the start line in Hopkinton, Massachusetts, before making the run back into Boston for the 119th running of the Boston Marathon. The race is the world’s oldest annual marathon, and other than the Olympics and various championship races, Boston is the only marathon that maintains qualifying time requirements. Several thousand slots are also available for charity runners who, in lieu of qualifying, raise money for partnered charitable organizations each year. For many runners, like Kevin, running the Boston Marathon is the pinnacle of marathons. Kevin says the history of the race makes it his favorite. At that point, Kevin says, it’s an overwhelming feeling of accomplishment. Three of Kevin’s colleagues will be hitting the streets of Boston on Monday, as well. Alfred Scaletta, strategic account executive at TDS Metrocom, is running the Boston Marathon for a 13th time on Monday. Though training through the Chicagoland winter added an unwelcome challenge to training for the race, Alfred enjoys the freedom of running. “It’s inexpensive and you can do it at any age, anytime, anywhere,” he said. Nicholas Nicholson, IT solutions analyst with Telephone and Data Systems, raised more than $5,000 for the American Medical Athletic Association Youth Fund Ch​arity to participate in this year’s Boston Marathon, his first. He’s running in memory of his mother, Mary. Race day – April 20 – is the 14th anniversary of her death. ​Nicholas is working toward a goal of running a marathon in all 50 states, and he’s 27 states into the lofty goal. With 33 total marathons under his belt, he’s also knocked two of seven continents off his bucket list, too. But back in his home country, out on the Boston course, he’s looking forward to the great crowd support. “I’m looking forward to seeing my friends and family among the many folks at Heartbreak Hill,” Nicholas said of the legendary hill just over 20 miles into the race. I’m also running my first Boston Marathon on Monday, and as you read this, I’m already enjoying the sights and sounds of Beantown. Qualifying for the Boston Marathon has been a dream since running my first marathon 10 years ago. Boston will be my 16th marathon, but undoubtedly the most special. Kevin and I, unbeknownst to each other as we were mere strangers last June, qualified at the same race – the 2014 Grandma’s Marathon in Duluth, Minnesota. However, while it took me 15 marathons to reach a qualifying time, Kevin did so at his very first marathon in 1986, squeaking in just under 3 hours. That’s incredibly fast, by the way. He didn’t make the trip to Boston, though, until a few years later when he qualified again in 1991. He qualified at Grandma’s Marathon those two times, as well. For Kevin, running offers time to reflect, and that’s what makes it so enjoyable. Surely, running the Boston Marathon has been a great idea for each of us.